We say it all the time—move from the center—but, truth be told, a great deal of the time, when something isn't working, guess what the culprit is? And I don't necessarily mean "moving" in the sense of your center traveling over a certain distance, but just about every action (aside from some ikioi ideas) needs to have the hips engaged and zeroed in on the target. Have everyone pair up, and give each pair an extra obi. There are two experiments each pair can do. Have tori stand stationary facing one end of the dojo. Have uke stand behind him, facing the same direction but several paces back. Wrap the belt around tori's waist so that uke is holding either end in each hand, and there's no slack. The object here is for tori pull uke and for uke to try and resist being pulled. First off, have tori move incorrectly. Try going forward by stepping with your foot leading. You probably won't move uke an inch. Now, try leaning forward with your torso. Again, uke probably won't budge much. Now, tori can move with their center. Pick up a foot and drop into the step, leading with the center. Suddenly, even small a tori can drag a bigger uke! Start just the same as before. This time, uke's job is not to prevent tori from moving anywhere, but just to keep the slack out of the belt, pulling just enough to establish tension. First, have tori stand with their weight on their heels. 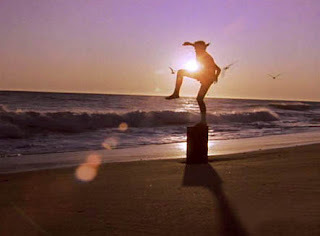 Okay, remember the Karate Kid (the original) standing on that pier in the ocean, lifting on leg and both arms in the fabled "crane style"? Well, tori doesn't need to raise their hands like that, but try to lift just one leg like a crane. I think you'll find that, even though uke isn't necessarily pulling on tori, but merely with enough tension to keep out the slack, tori will stumble backwards. Now, have tori stand with their weight on the balls of their feet, knees slightly bent. Try and raise one leg like a crane. Here's the thing—you still might find yourself falling back if your posture isn't quite right, if your shoulders and hips and feet aren't quite in the right alignment. You'll feel it when they finally do settle in; your body will feel so much more stable and strong (and despite the slight tug of the belt, you won't fall). It was surprising to me how much so. Indeed, it's amazing what we can get away with when moving about casually through the world and still keep upright. There's lots of ways to "cheat" and to stand or move with the least amount of work possible! But when it's time to do a job—be it aikido or judo, construction work, playing sports, operating tools—our body needs to move in the most efficient and powerful way it can in order to do that job effectively.